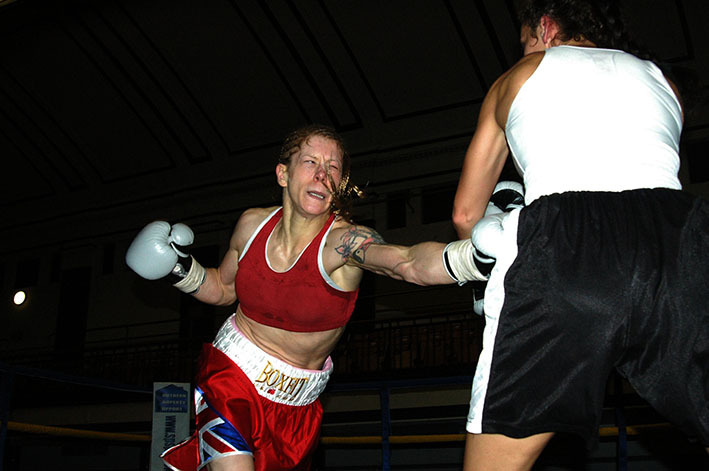 Woolwich, London’s Marianne ‘Golden Girl’ Marston utterly dominated proceedings, when she fought Hungarian #1, European #3 and World #31 ranked Marianna Gulyas to secure the vacant MBC International Super Bantamweight title, at York in London, England on Saturday night. From start to finish it was the slick British southpaw that took the fight to her much more experienced opponent, aggressively going forward, utilizing her sharp jabs and stinging lefts to great effect, Marston appeared to be able to pick off her opponent at will, leaving Gulyas to defend on the retreat. Gulyas visited the canvas seven times throughout the fight, however only twice did referee, Germany’s Alf Sprung, deem the visits to be knock downs, the others he waved off as slips or pushes. There was a rather scary incident in the eighth. Marston was throwing big lefts as she backed Gulyas onto the ropes, one of these sent the Hungarian of balance, forcing her to grab the forward marching Marston, in doing so Gulyas went backwards through the ropes as well as pulling the Londoner face down, out of the ring and onto the officials table. Luckily neither protagonist received any injuries from the incident and both were able to continue to see the fight out to the end. After ten rounds of excellent boxing from Marston the highly vociferous crowd at the famous home of boxing in the Capital city were clearly overjoyed when the judges scorecards were read out, as was Marston and her team. Judges Ben Doughty (UK) and Matt Hamilton (South Africa) scored the bout 100-89 and judge Lee Murtagh (UK) scorecard read 99-88 all in favour of Marianne Marston. 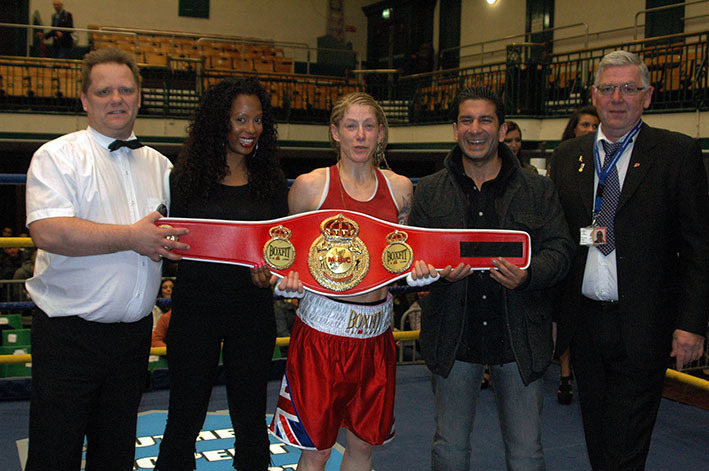 Following being presented with the BoxFit UK sponsored MBC International Championship belt - by supervisor Dave Smith, MBC International title bout sponsor Baz Rehman and Melissa Lewars who represented sponsor JT Clarke London Limited – Marston said. “I’m speechless really, I can’t put into words how I feel right now. I owe so much to so many people, without them I would never have been here fighting for a title. I’m dedicating the fight to two people Joe Frazier and Rio (Gianluca Di Caro), they are my inspiration, they both believed in me from day one. Unfortunately Joe passed away and couldn’t be here to see me win, but I feel that he was here in spirit and hope that he is pleased with how I fought. Rio is right here, as always supporting me and this victory is for him, but he’ll have to share it with my coach Brian O’Shaughnessy, my sparring partners Ian ‘Dappa’ Napa, Sunny Edwards, Sonia Dlay and Irema, my manager Johnny Eames and of course my wonderful promoter Dave Murphy as without them this day would never have happened. I also have to say a huge thank you to Malta Boxing Commission and MBC International, my wonderful sponsors Optimax, BoxFit and JT Clarke London, my gym mates Billy Joe Saunders, Darren Hamilton, Tommy Martin, Joe Stevens, Ian Bailey and Freddie Turner, who have been so supportive, as has the lovely Wadi Camacho and Charlie Edwards. More than anything I have to say a huge thanks to my supporters, they are the best in the world, thank you for everything, not just buying tickets and coming to see me fight but your wonderful messages of support.